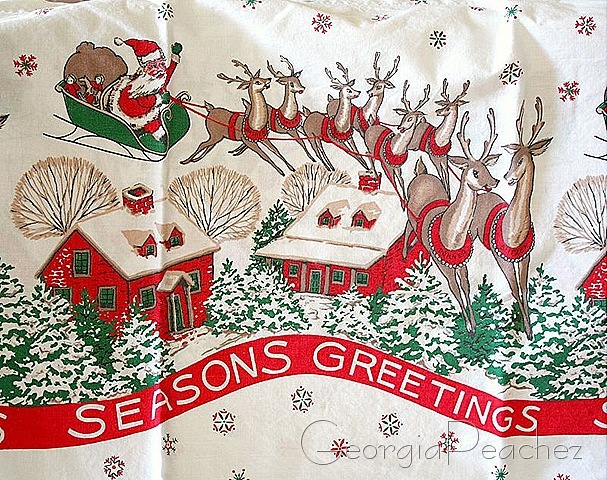 Vintage Christmas Fabrics of Course! 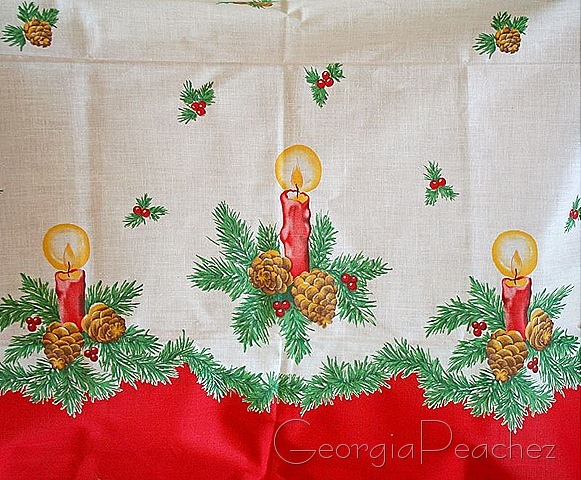 If you have read much of my blog then you know I collect vintage christmas stuff with abandon. 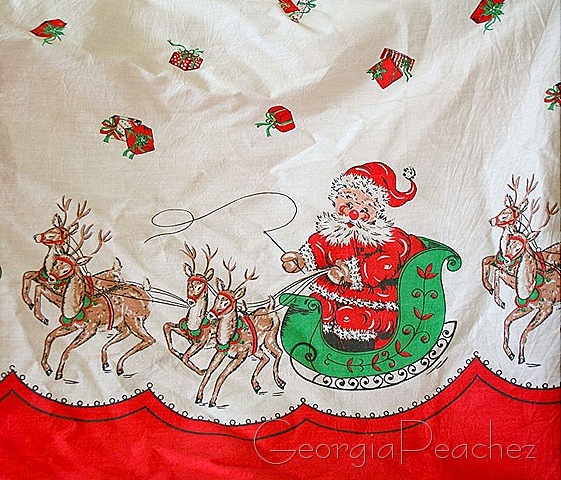 You would also know that I adore vintage textiles, so OF COURSE I collect vintage christmas fabrics. In fact my collection is quite extensive. Over at True Up it's nothing but christmas prints from now through Dec 25. They also have a flickr pool for fabrics and you can see more there. I snapped pics of my collection to share here, pardon the creases! I saved the best for last, this is one is my absolute fav. I just made a tote bag from this fabric. I love polka dots too. ya think. These fabrics are just so whimsical and fun. They are almost all border prints and they were sold as yardage. 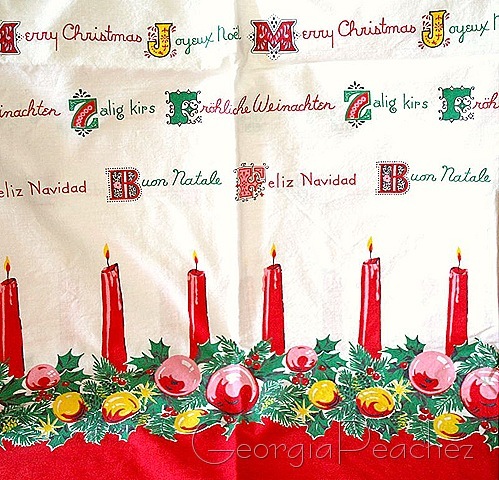 Often they were made into curtains, pillowcases and of course aprons. OK the tree print and the Merry Christmas Language prints are to die for! Great amazing finds! My goodness what a super collection!! I think my favorite is the snowman…they are just too cute for their own good. Cute fabrics and oh my goodness I love the little bag you made, it’s adorable. I bought a tote from you a few years ago with your shiny brite favorite fabric and I absolutely adore it! Love your talents! I kept finding a favorite (candy canes in baskets) and then another (Season’s Greetings) and another (Christmas in every language) and another (the snowmen) … they are wonderful. 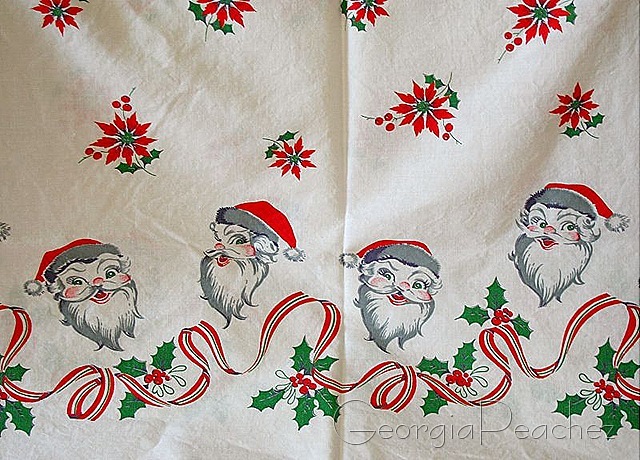 The only one I have is the last of your Santa border prints – the pillowcase I slept on when I was a kid. Great post! Holy cow!! I love all of those!! 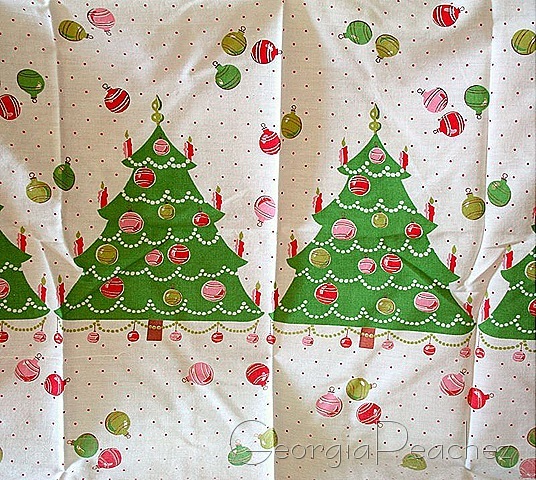 Especially the Christmas tree print!!! What an awesome collection! You are so lucky to have found so many. How long did it take you to collect them all? Are they all vintage? I want to know where to get some of these! I love border prints and these are just so cute. Wowser! That is a great collection. I have a few, but not as many as yours. Thanks for sharing (creases and all…who has time to iron during the holidays! )That purse would definately make holiday shopping fun! Fabulous collection and a great bag. I would have the hardest time cutting any of these fabrics–what you have done is very inspiring. Wow I love all your fabric!!! And the last one in my favorite too. Great purse!!! I’m having some serious fabric envy! 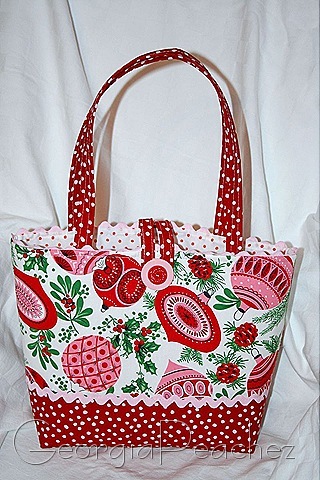 I’m a huge polka dot fan myself and the bag is gorgeous. As are the fabrics. I love the pink with the red and green. 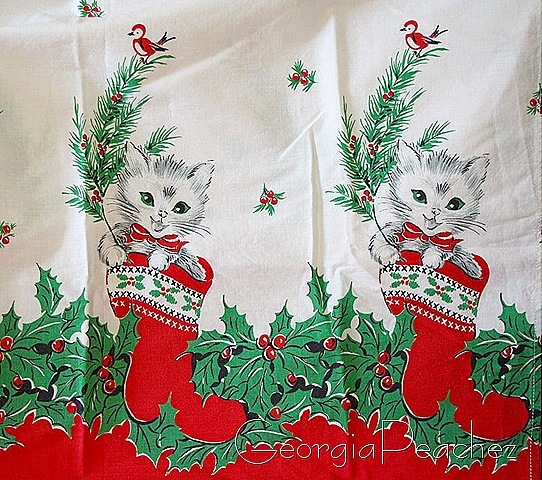 I don’t collect Christmas fabrics but I just bought an apron made with the kitten in a stocking border print – so cute. Thanks for sharing your collection! I’m so envious of your collection, the fabrics are all so lovely! 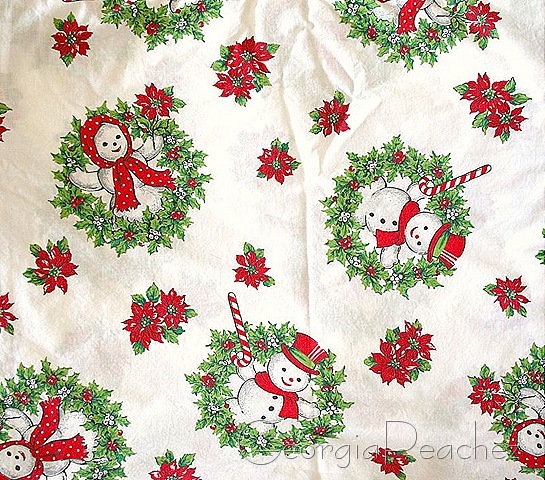 Hey – made me smile to see the vintage fabric you purchased from me in your pictures! So happy it went to a great home. Now I am heading to your shop to shop for friends! Of all the blogs I read, Suzy, I could have picked this out as yours without the name or anything. It is so you. You have some great vintage collections, lovely holidays. OMG I am loving that purse you made. Soooo very cute. 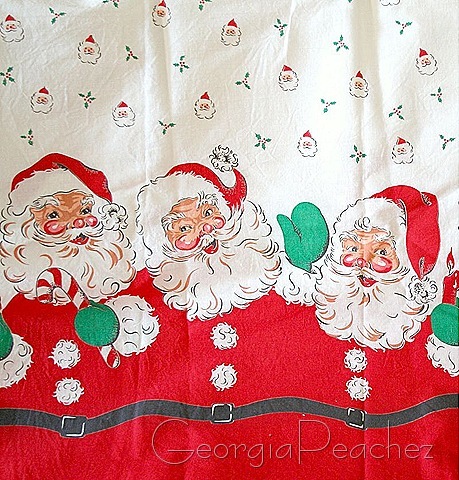 Also love the Santa and Christmas tree fabric. You’ve got quite the collection there. Wowzer! What a fab collection of Christmas fabs. 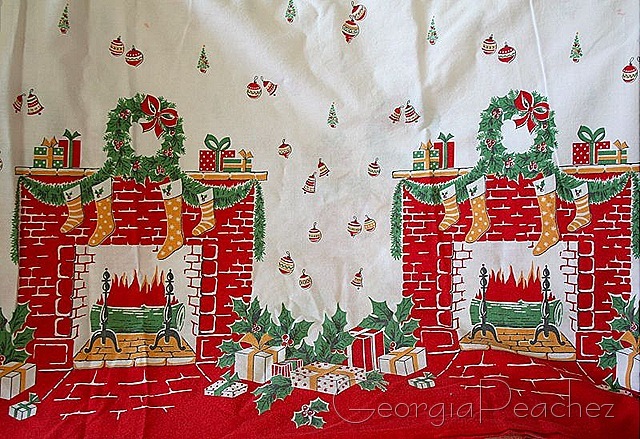 I smiled ‘cuz I have an apron with the Christmas trees/ornaments & dots. Terrific bag there, too. Unless the lunchcloth is damaged, it’s a sin to *repurpose* them into something else– ouch! great collection: please preserve! Hi! I saw your comment on the Red Bulletin Board blog and wanted to see the 11 trees for myself! I can barely manage one! Do you have posts about your trees? I’d love to see them! I don’t think it’s a sin to repurpose these wonderful fabrics into something that can be enjoyed. I think it’s a SIN to keep them packed away. It is fabric after all! Fantastic! 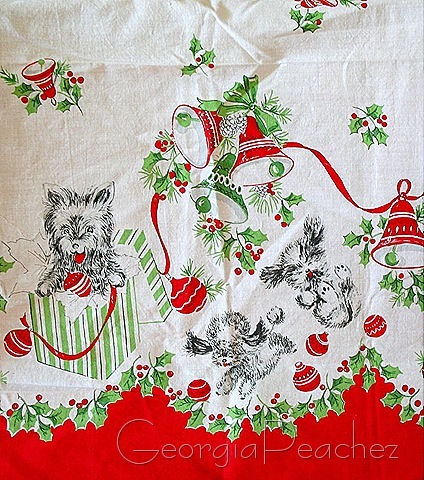 Without a doubt….you win my vote for best vintage collection of Christmas fabrics and I am pea green with envy! Hi, I’m Holly I’ve been seeing you around Jenny’s place. Love your blog and loooove those kittens! Merry Christmas! where can I buy some of the Dakin dream pals red reindeer? OH SUZI I have a decent size collection going want to make quilt/blankets (i’m not a quilter) to have on the couch during the holidays to stay cozy under. You have some beauties! just love them! This was like seeing an old friend! I did not remember until I read this post that I sold you “mr santa rosey checks in the sleigh” picture #2! It was so fun to see that fabric again! Stay safe and warm during the storm. 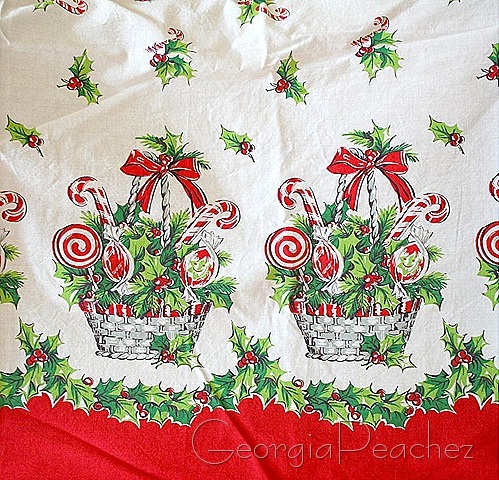 Vintage fabrics have more meaning to me than any other fabric that I use during the holidays. 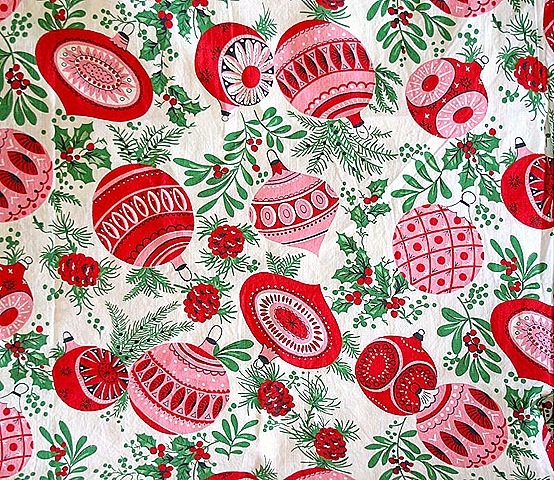 This is beautiful vintage Christmas fabric, especially the one you made the purse from. Can you tell me where I can buy that fabric from. I’ve looked at the True Up website and I see nothing like that. Thanks!